You can find my books on Barnes and Noble, The History Press and Amazon. 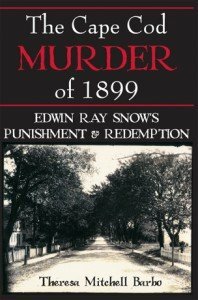 When Edwin Ray Snow, a seventeen-year-old petty thief from Yarmouth Port, fired a .32 caliber bullet into Jimmy Whittemore’s brain on a crisp September evening in 1899, he would later insist, “If there is a definite why to this act, I can’t explain it.” But the horrific damage was done. And Whittemore, a 21-year-old bakery delivery man who was the sole financial support of his widowed mother and a slew of younger siblings, was dead before his body hit the dirt road in the woods separating South Yarmouth from Yarmouth Port. After Jimmy’s body was discovered the following morning, folks suspected right away who had murdered him since many had seen the pair riding aboard the delivery wagon the previous day. Four months later, in January 1900, Snow pleaded guilty to murder in the first degree in Barnstable Superior Court. He was sentenced to death in the brand new electric chair acquired by the Commonwealth of Massachusetts. A short time later, a plea bargain deal commuted the death sentence to life in prison because authorities didn’t think putting a teenager to death seemed right. Snow lingered in the Massachusetts prison system for decades. His compelling story, however, didn’t end behind bars at Charlestown State Prison. Just before Thanksgiving in 1919, Edwin escaped simply to experience a ride in a car. Snow got his wish but was quickly recaptured and earned time in solitary confinement. “Well, you’ve made a nice mess of things, Snow,” said the warden. Snow’s redemption was as dramatic and uplifting as his crime was heinous. But slowly, forgiveness from Jimmy’s mother and his own parents was finally bestowed upon Inmate #12673. With particular attention to what the heartbroken mothers of the killer and victim endured, Theresa Barbo has composed a compelling book for true-crime aficionados and those interested in the Massachusetts prison system at the turn of the 20th century. Drawing upon town records, historical documents, correspondence and newspapers of the day, The Cape Cod Murder of 1899 recreates the towns of Dennis and Yarmouth, circa 1900. It’s a fascinating story. Dr. Ira Silverman, a forensic psychologist, composed the foreword. Pure and simple, it was a quintessential, Victorian-era, small-town scandal. In early November 1866, a teenager, Elizabeth, from a prominent family in the Cape Cod Town of Dennis drank turpentine to induce an abortion. “…and in doing so, it destroyed the lives of both,” wrote one sea captain’s wife to her husband. The shame was too great for her family to endure, and her father buried her in an unmarked grave. 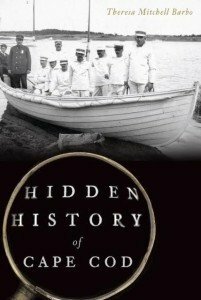 So goes one of the true stories in this book that unearths fresh essays into Cape Cod history. What makes this book different from all others is its focus on the human element of people of yesteryear—their emotions, experiences, joys and defeats. Real lives were lived and they come alive on these pages and not merely exist as words in ink. The stories range from the 17th through the 20th centuries, and are divided into two sections: Home, Heart and Community, and Tragedy and Terror: At Sea, 1626-1956. If you ever wanted a fresh immersion into this iconic region, you will want to read this book. Anyone familiar with East coast maps will recognize Cape Cod Bay, but ask yourself how well do you know its history? Cape Cod Bay is the southernmost reach of the Gulf of Maine and is a vibrant ecosystem and a wealth of biodiversity. Formed by an ancient, retreating glacier, its waters that run counter-clockwise have been the reluctant host to pirates and welcome point of landing to weary and lost Plymouth colonists. In the 17th century, codfish in Cape Cod Bay measured at least four feet and when cooked in butter, the dish made for a fine lunch according to John Pory, a European trade representative who visited Plymouth Colony in 1622. “No place in the world that can match it,” he wrote of Cape Cod Bay. 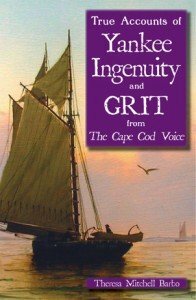 Indeed, the early days of the Plymouth Colony and generations afterward along the shores of Cape Cod Bay reveal an emerging culture defined by ambition, fortitude and commitment. Native Americans rendered fat from whales along Barnstable Harbor. Later, though, white settlers dismantled the Native culture in only several generations, Native village by Native village, till finally their ancestral sands were gone forever. Cape Cod sea captains sailed small schooner or “packet” boats between Boston and towns lining Cape Cod Bay. The British Navy patrolled Cape Cod Bay during the War of 1812, making this iconic waterway a dangerous war zone. In 1905, a large wooden sailing ship was iced-in for days after parts of Cape Cod Bay froze. Later, Prohibition-era rumrunners outfitted their boat with an airplane engine until finally they were apprehended. The stories go on and on. 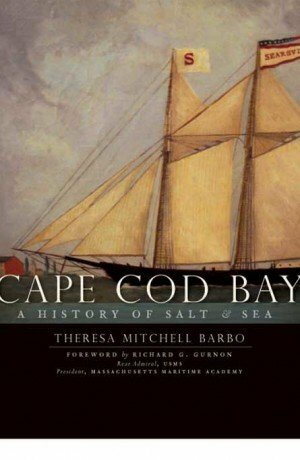 Be enriched by this first-ever history of Cape Cod Bay and see why its waters are forever mysterious, beautiful, and hauntingly interesting. Unique appendices by local, state and federal subject-matter experts including scientists shed contemporary context against the backdrop of the bay’s maritime history. Nantucket Sound sits at the juncture where cold Labrador currents meet the warm Gulf Stream and touches the Islands of Martha’s Vineyard and Nantucket, including the smaller chain of Elizabeth Islands. It’s also part of the larger Nantucket Shelf Region where its southeastern boundary drops into underwater canyons with names such as Atlantis and Munson. But truly, Nantucket Sound is all about gutsy people of yesteryear who went to sea to support their families on land. And in the 18th and 19th centuries, Nantucket Sound was filled with sailors, fishermen, sea captains and schooner skippers, even those who use its waters for both work and recreation today. The 1850 census for Harwich, with its numerous wharves sticking out into the waters of Nantucket Sound, reported that 71% of work-eligible men over the age of 15 were engaged in sea-related trades. And companies which profited from waves sprung up left and right all along towns lining Nantucket Sound: Thomas Sparrow, John Reed and Isaiah Lewis formed a fishing cooperative called Sparrow, Reed and Lewis in 1847 off Monomoy. In Chatham, the saltworks at Stage Harbor belonged to William Hamilton and three other partners. But Nantucket Sound was dangerous, too. In 1789 a schooner went down in a storm with all six hands including four men from the same family. And on October 3, 1841, Captain Eben Bray, Jr., had just left the Sound for Georges Bank aboard the schooner Primrose when an infamous gale blew through and Bray and his men were gone forever. Tourism bloomed as a key industry in the late 19th century and the region was never the same again. 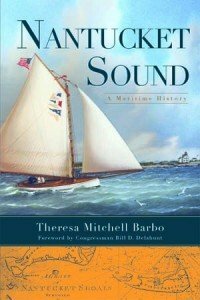 In Nantucket Sound: A Maritime History, a reader will appreciate this special place in a fresh, engaging way in this first-ever chronicle of one of America’s most storied waterways. It happened long ago: February 18, 1952. 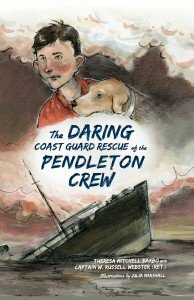 One particular Coast Guard rescue mission with its mismatched crew of four young men has survived the proverbial test of time, but how? 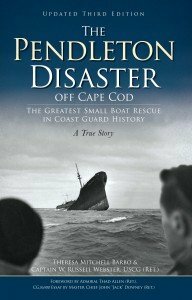 Why is the saving of thirty-two merchant mariners from the sinking 503’ Pendleton still a sacrosanct story within Coast Guard corridors and leadership circles some sixty-three years later? For these four crewmen, all in their 20’s, undertaking the mission was simply their duty for the Coast Guard whose motto in those days was: ‘You have to go out, but you don’t have to come back.’ But come back they did because of luck, superb seamanship and leadership by Webber. As Bernie skillfully navigated the 36500 over the Chatham Bar during a Nor’easter, high winds tore the compass from its mount and the windshield collapsed. But in the pure darkness, Bernie and his crew motored onward into the belly of the storm intent on locating the Pendleton and rescue possible survivors. All told, 70 of 84 crewmen aboard the Pendleton and Fort Mercer, another 503’ oil tanker that snapped in two during the storm, were rescued by the Coast Guard, with the U.S. Navy assisting in the Fort Mercer rescue. Jack Nickerson and his faithful lab, Sinbad, wake early one snowy Cape Cod morning, ready for winter fun. Meanwhile, miles away in the ocean, the crew of a cargo tanker ship called the Pendleton is in serious trouble. The waves and wind of a raging Nor’easter rip the tanker in two, leaving survivors to fend for themselves in the wicked, cold storm. There’s no time to waste! The Coast Guard, including Jack’s friend Bernie Webber, leave Chatham Harbor in search of the Pendleton crew. They don’t know that Jack and Sinbad have snuck aboard the rescue boat as stowaways. Join the young duo in the front row for the greatest small-boat rescue in Coast Guard history. Illustrator Julia Marshall’s work is featured in this children’s edition intended for readers aged 9 to 13. Here, Theresa has once again partnered with Captain W. Russell Webster (Ret.) for their second book together which is a masterful fusion of fiction and non-fiction to engage a young reader’s imagination. In 1837 a milestone went unclaimed in Cape Cod history: the last black bear on this sandy peninsula saw its final morning. Wolves were gone in New England by 1850, and from Cape Cod way long before that when colonists were paid a bounty to kill them in the 17th century. Well into the 19th century, wild animals were considered a nuisance. One cool morning in late fall 1877 Isaac Sears of East Dennis awoke piping mad. Overnight, a fox that favored poultry had devoured every chicken in his henhouse and that fox, too, saw its last morning. And that’s the way wildlife was treated in yesteryear: if animals bothered people or competed with us for food in any way, we killed them. Today, so much is different. A conservation movement is afoot to save the turtles that would have been cooked into soup 150 years ago, for example. Indeed, the human imprint toward wild creatures and their habitats has evolved into a kinder, more understanding presence. In a civil society, we embrace the concept that wildlife provides intrinsic value to Cape Cod. In fact, the protective framework on local, state and federal levels has never been stronger or friendly to our wild brethren. 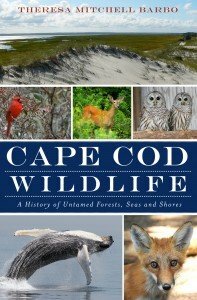 This first-ever book on human attitudes and actions toward wildlife on Cape Cod by Historian Theresa Barbo includes chapters on invasive species, freshwater fish restoration, whales and other cetaceans. Songbirds and birds of prey including falcons, hawks, osprey and eagles round out this book, all conveyed in an interesting narrative that will enrich, entertain and educate. After reading it, you may look at wildlife through a fresh lens. A compelling foreword by Mark Pokras, D.V.M., of Tufts University is complemented by a thought-provoking Introduction by Thomas French, Ph.D., with the Massachusetts Division of Fisheries and Wildlife. The proverbial salty waves and sandy beaches of Cape Cod disguise its fascinating and nearly forgotten history. There’s history that is hidden beneath our feet, over our heads and sometimes right before our eyes. Learn why one of the most famous rescues in Coast Guard history spent nearly fifty years in the shadows without public notice. Discover which wild creature went from the 19th century soup pot to enjoying conservation protection under state law. Historian Theresa Mitchell Barbo explores these mysteries and more, from the lost diary of a nineteenth century schoolteacher to the reason Cape Codders call their lunch “the noontime dinner.” Join Barbo as she lifts the lid on the quirky and remarkable character of Cape Cod and its forgotten and neglected happenings of yesteryear. Copyright © 2014 Theresa M. Barbo All Rights Reserved.